The Radiation sensor ML69m senses alpha, beta and gamma radiation. Alpha, beta, gamma radiation ionize material they strike or pass through. The amount of radiation is generally determined by measuring the resulting ionization. The Radiation sensor uses a Geiger-Müller tube to detect this radiation. The Radiation sensor ML69m is a digital sensor (on-sensor digital conversion), which gives calibrated values of the measured quantity. 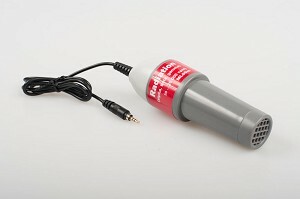 This sensor can only be connected to the CMA MoLab interface and not to other CMA interface such as VinciLab, CoachLab II+ or EuroLab.